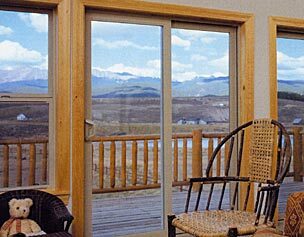 Our Tuscany series sliding patio door is our most popular. Its thicker frame profile offers a more traditional look. For a more elegant look, choose our French-style sliding patio door. A favorite of architects, builders and homeowners, it combines the look of a French door with the space-saving design of a sliding patio door. Click to view standard door sizes. will be upgraded to Tuscany series specifications. Tuscany Series patio doors available in 2, 3, or 4 panel options. Maintenance-free vinyl frames won't crack, peel or require paint. State-of-the-art adjustable rolling assembly for effortless operation. Steel reinforcement beam for performance exceeding nation's toughest forced-entry codes. Exceeds criteria for structural integrity and reliable performance established by the American Architectural Manufacturers Association (AAMA). Milgard SunCoat® Low-E glass glass for superior energy savings and protection against fabric fading.